Dustin and I left his house in Denver at 10:07 pm on Thursday night, and we made it to Phoenix by 10:18 am on Friday morning (we gained an hour so it took just over 13 hours). Dustin drove the first leg, I the second, and Dustin the last 148 miles. In all I drove 434 miles and Dustin 396, so we divvied it up pretty evenly. We took I-70 West into Utah, then 191 south into Arizona, where we jumped on 160 and eventually I-17. When we got to Moab, Utah, we hit some gusty winds and I was almost blown over when we stopped for gas at one point. By almost I mean I was standing and had to take a step, so maybe blown over was an exaggeration. When we were getting into Phoenix I called the Holiday Inn we’re staying at and asked if we could check in early, and the receptionist said we couldn’t. It all worked out because Dustin and I went to iHop for some breakfast. At 11:20 we got to the hotel and by that time we were able to check into our room. We were both exhausted and we napped until 3:00 pm. 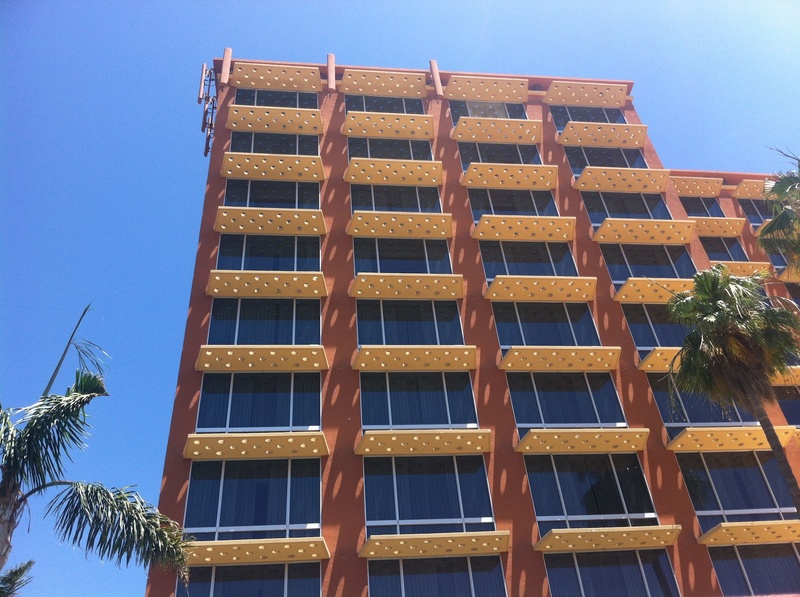 This picture is of the exterior of our hotel, I thought the balcony things looked like cheese, so it made me feel at home. 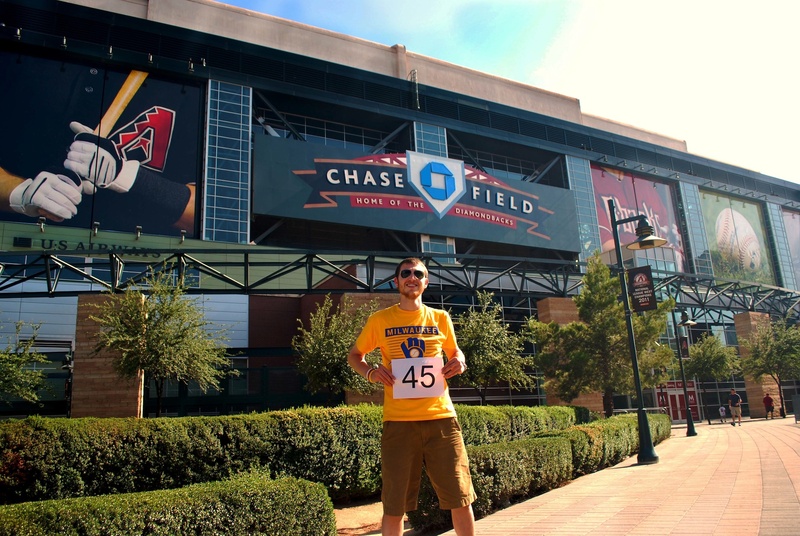 We jumped on the Metro rail at 3:45, and we were in front of Chase Field in less than 15 minutes. 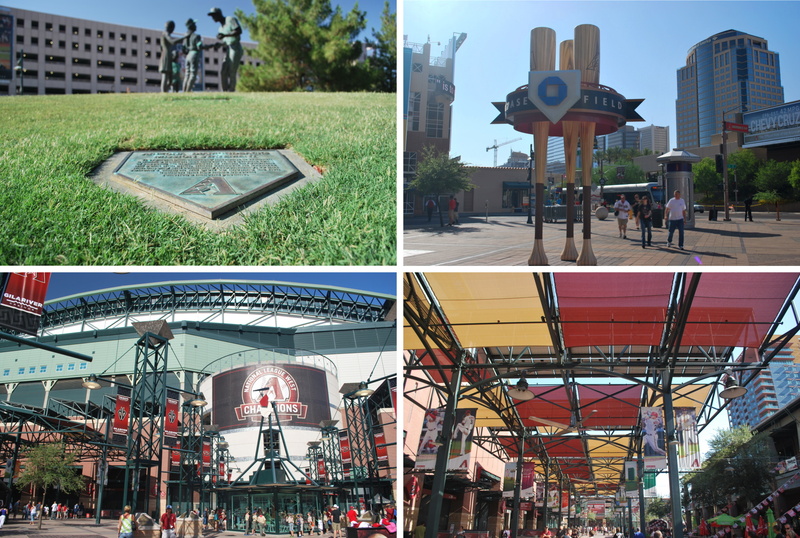 Chase Field doesn’t really have a welcoming home plate entrance, and the Chase Field sign is located out past centerfield. I guess this will have to do for game photo number 45. 1) The Diamondback’s Mission Statement plaque, and statue in the background. The plaque reads: “The Arizona Diamondbacks’ mission is to establish a winning tradition that embodies the genuine spirit of baseball; an organization to which all Arizonans will point with pride, which conducts its business with integrity and community responsibility; so that Arizona’s children will grow up knowing the rich tradition that has made baseball America’s national pastime.” I think the statue is of a few fans getting an autograph from a player (the back of his jersey is just Arizona – 98), so it’s no one in particular. 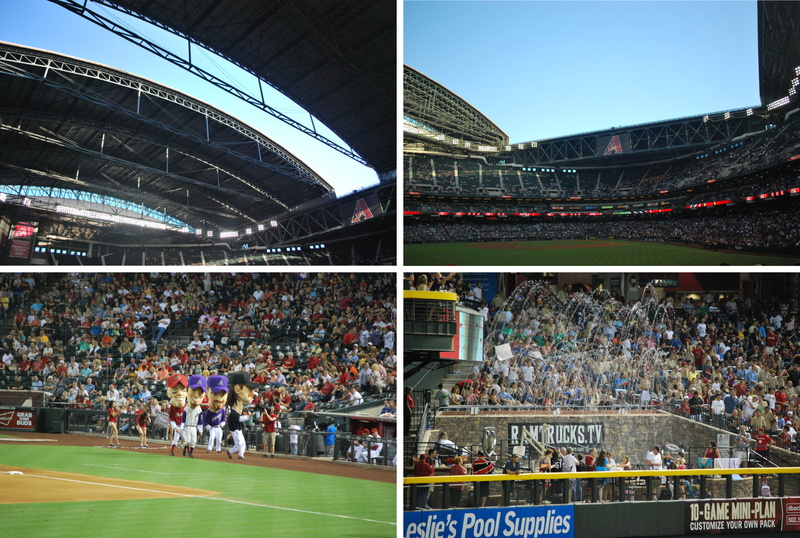 2) Three giant bats standing on the handles near the left field corner of Chase Field. 3) Awnings that span from the left field corner down to the first base entrance. There are fans hanging from the structure as well, and the shade provides a nice respite when it inevitably gets hot under the Arizona sun. 4) The “home plate entrance” I put it in quotes because I don’t think it’s a true home plate entrance since it’s really around first base. There is no traditional home plate entrance (behind home plate), otherwise I would’ve gotten my picture outside of it. Do you see the structure on the lower right side of picture number 4 above (on the lower left)? That’s some sort of contraption, and Dustin and I don’t know what purpose it serves. 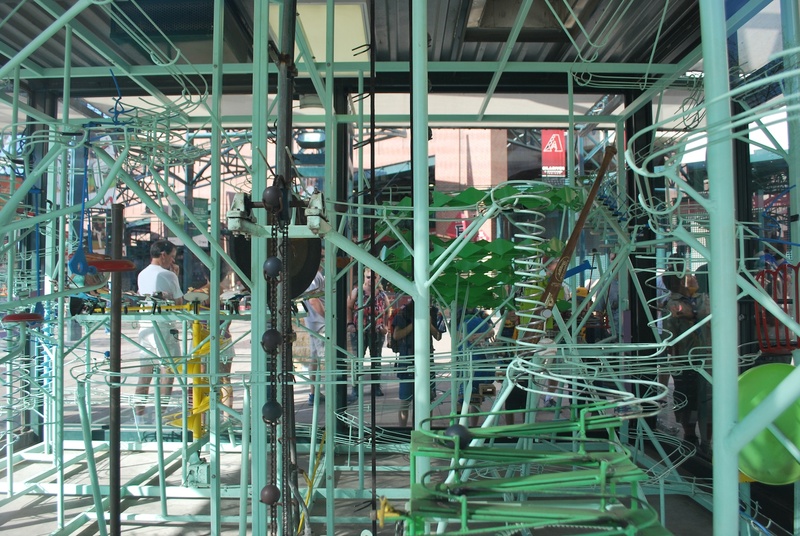 Whatever it is, it is encased in glass, and it has lots of moving parts. I took a picture of what is inside (below). There were lots of baseball sized balls going every which way, and you can see a few of them being lifted on the left side of the photo. The exterior of the stadium isn’t all that exciting, but neither is Miller Park’s, so I can’t bash it too much. Four more pictures, going clockwise from top left. 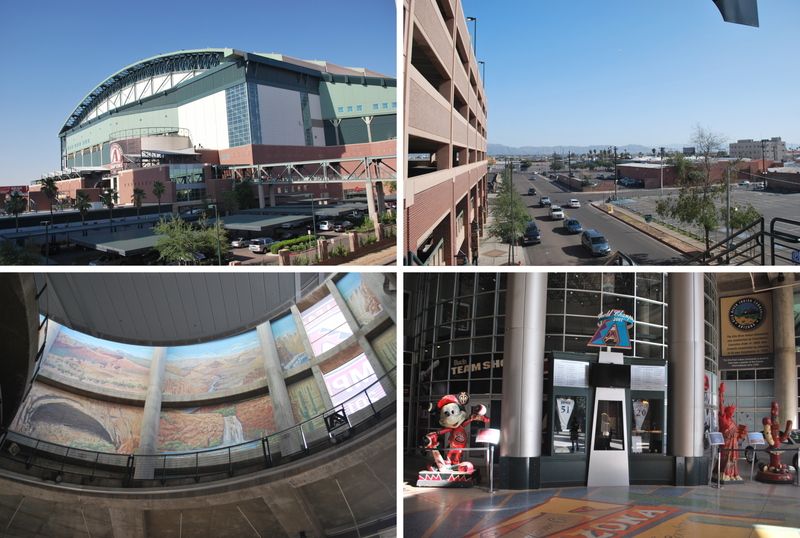 1) The southwest corner of Chase Field, as seen from a skywalk the leads to a parking garage, you can see the other skywalk on the right side of the picture. 2) The view from the skywalk I took the first picture from, this one looking south, the parking garage is on the left. 3) Just inside the gates of the stadium they showcase their Micky Mouse statue, from when the Angels hosted the All-Star game, and the mini Statue of Liberty from when the Yankees did. The cactus is from last year’s All-Star game, when the Diamondbacks hosted. In the middle is their World Series trophy, from when the won it all back in 2001. 4) This is looking up from where picture three was taken, on the walls of the mini atrium are murals depicting Arizona’s landscape. Once inside the stadium we walked around and then took in the Brewers portion of batting practice. We sat/stood in left-center field, and it’s a great spot to take in a game. You can see Tim Dillard in the lower left hand corner of the picture below. When batting practice was getting started he made his way to the outfield to shag balls and throw them back in, something all relievers do to some degree. Tim Dillard can do a good Harry Caray impersonation, and I can do a decent one. I yelled “TIM!” until he turned to look at me, and then I shouted in my best Caray voice “HEY, IF YOU WERE A HOT DOG, WOULD YOU EAT YOURSELF? BECAUSE I WOULD, I’D PUT MUSTARD ON ME!” That comes from a Saturday Night Live skit when Will Ferrell does a Harry Caray parody. Dillard acknowledged my impersonation and made the face that goes with his Caray impersonation (something that I cannot do). It was funny and cool at the same time. 1) A sign that we saw, I had to do a double take, $4 beer!?!?! They sell $4 fourteen ounce drafts of select beers. That’s the cheapest beer you’ll find at a game anywhere in a MLB stadium. They also have value menu items at certain concession stands. $1.50 hot dogs, $1.50 corn dogs, and a few other bargain-priced items. I wound up having a hot dog, a corn dog, and a beer, which came to a whopping $7. Dustin returned to the concession stands later in the game and I had another corn dog and another beer. So in all I had a hot dog, two corn dogs, and two 14 ounce beers, for $11.50! Well played, D-Backs, well played. 2) We were sitting in the left field bleachers for Friday’s game. While waiting for first pitch a few D-Back employees came out and started vacuuming the field. I’ve seen it before, I think, but it’s still funny (to me anyways). I think they’re mainly getting sunflower seed shells, but I’m sure they remove any foreign object. 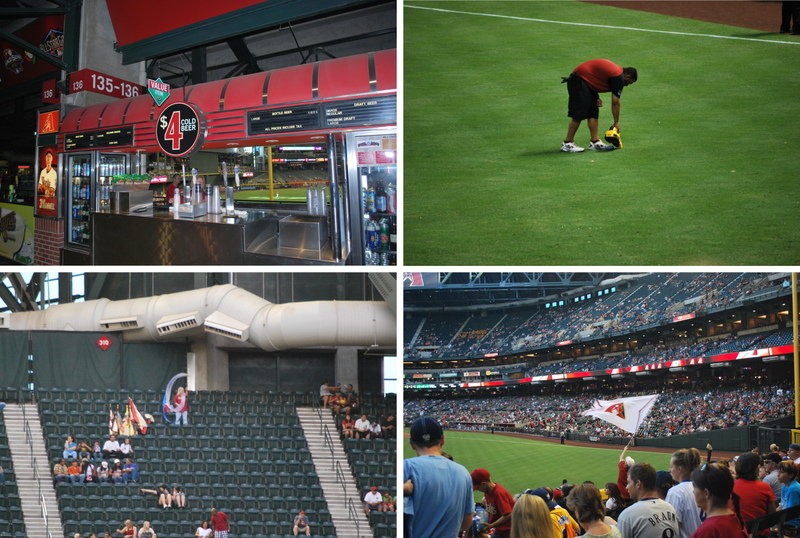 3) A fan below us waving a Diamondback’s flag. Apparently large flags are allowed, because we saw a few other fans with decent sized flagpoles and flags. 4) A fan in the upper deck, waving some sort of ribbon, which reminds me of Will Ferrell in Old School, when he does the ribbon routine towards the end of the movie. As you can see, to the ladies’ right are even more flags and ribbons (I’m assuming she’s a regular). They showed her on the jumbotron a few times, and she was trying to get the crowd excited. The game got underway at the scheduled time of 6:40, and the Brewers got on the board early, on a solo home run by Rickie Weeks in the second inning. The Crew added three more in the fourth, two via a Braun home run, the other on a single from Izturis. Izturis later left the game with an injured quad, and is now on the disabled list. At this rate the Brewers will be fielding a AAA infield by the All-Star break. The D-Backs got one back in the fourth on a it’s-my-birthday-I’m-gonna-hit-a-home-run-to-celebrate dinger from Jason Kubel. The Brewers tacked on two in the eighth and one in the ninth, and that concluded the scoring. Final Score: Brewers 7 – Diamondbacks 1. A few more things from the game, again going clockwise from top left. 1) Just before the game was set to start they began opening the roof. It was still 91 degrees when the game started, but it didn’t feel that hot. With a nice breeze it was probably the most comfortable I’ve been at a game this year. 2) The roof after it was opened all the way. 3) After home runs they turn on some fountains in the pool area. 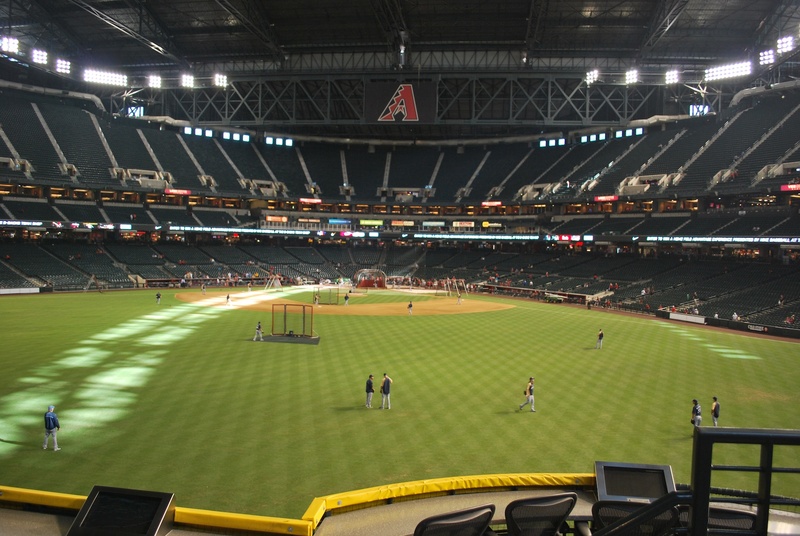 Yes, there’s a pool in Chase Field. I’ll get a better picture of the pool today, because you can’t really see it in this picture. 4) It’s no sausage race, but their retired player race is pretty good, albeit staged. The running gag is that Mark Grace (in purple) never wins. In this race he got out to a big lead, started skipping and celebrating then was passed by Randy Johnson. Grace wound up tripping and falling down (on purpose), while Randy Johnson got the win. 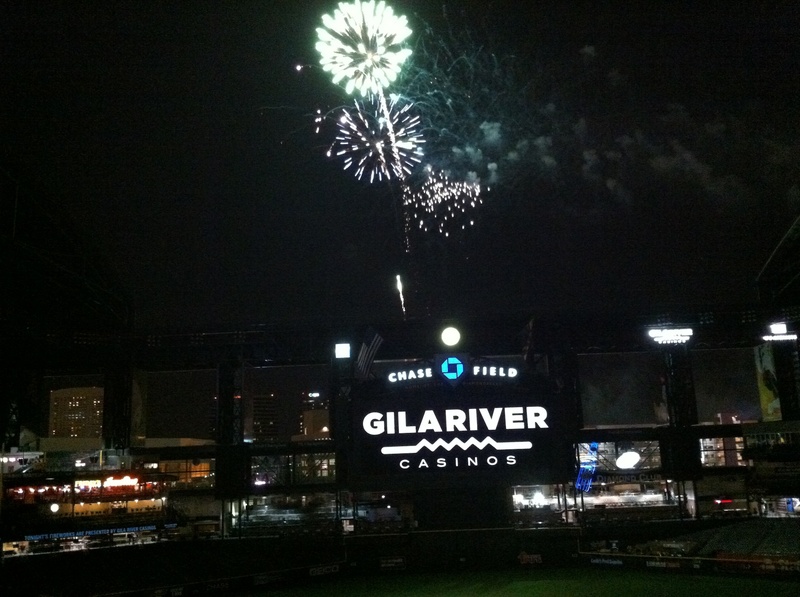 It was fireworks night at the ballpark, and after the game Dustin and I went to the upper deck. It was a short show, but it was still cool to see some fireworks in a different setting. The picture isn’t that great, but I’m sure you all know what fireworks look like. I missed two pitches at this game, and I’m disappointed in myself. The first was the fourth pitch to Ryan Braun in the 5th inning. Another intentional walk mental lapse on my part. After I saw the third pitch was an intentional ball, I started reading the scoreboard, and missed the 3-0 pitch. I also missed the first 0-2 pitch to Aaron Hill in the bottom of the eighth. I was reading and then returning a text, and looked up after he hit the foul ball. Walsh had wanted to see a new record streak, but I’ll have to be more disciplined if it’s going to happen on the road trip.